excipients: Microcrystalline cellulose, magnesium stearate, calcium phosphate dibasic. Ascorbic acid is a water-soluble vitamin essential for the synthesis of collagen and intercellular material. It is involved in some oxidation-reduction reactions. It is also involved in metabolism of phenylalanine, tyrosine, folic acid and iron; utilisation of carbohydrate; synthesis of lipids and proteins; and preservation of blood vessel integrity. Ascorbic acid is readily absorbed from the gastro-intestinal tract mainly the jejunum. Large quantities limit the absorption. Binding to plasma proteins is low, approximately 25%. It is widely distributed in the body tissues. Biotransformation occurs in the liver. The amount of ascorbic acid in the body in health is about 1.5g. The concentration is higher in leucocytes and platelets than in erythrocytes and plasma. In deficiency states the concentration in leucocytes declines later and at a slower rate than the concentration in plasma. It is reversibly oxidised to dehydroascorbic; some is metabolised to ascorbate-2-sulphate, which is inactive, and oxalic acid which is excreted in the urine. Ascorbic acid in excess of the body’s need is also rapidly eliminated in the urine. Ascorbic acid crosses the placental barrier and is distributed in breast milk. It is removed by haemodialysis. There are no other preclinical data of relevance to the prescriber which are additional to that already included in other sections of the SPC. Prevention and treatment of scurvy. Prophylactic: 25 – 75 mg daily. Note: Thеsе unit dosages forms аre unsuitable for prophylactic use. Therapeutic: Not less than 250mg daily in divided doses. Children under 6 years: these unit dosages forms are unsuitable for children under 6 years. Ascorbic acid is usually well tolerated. High doses may result in diarrhoea, flushing or redness of the skin, headache, increased urination, nausea, vomiting, stomach cramps and occasionally back pain. Ascorbic acid may cause haemolytic anaemia in certain individuals with a deficiency of glucose-6-phosphate dehydrogenase. Increased intake of ascorbic acid over a prolonged period may result in an increase in renal clearance of ascorbic acid and deficiency may result if it is withdrawn rapidly. Large doses are associated with the formation of renal calcium oxalate calculi. Ascorbic acid should be given with care to patients with hyperoxaluria. The administration of therapeutic doses may interfere with Clinistix test for glucosuria giving a false negative result. Ascorbic acid in doses greater than 1g should not be administered during pregnancy as the effect of large doses on the foetus is not known. No problems are anticipated with the administration of ascorbic acid tablets during lactation. Adverse effects are not normally expected from an acute overdose of the water soluble vitamin. Renal failure can occur with massive ascorbic acid overdosage. Concomitant administration of aluminium-containing antacids may increase urinary aluminium elimination. 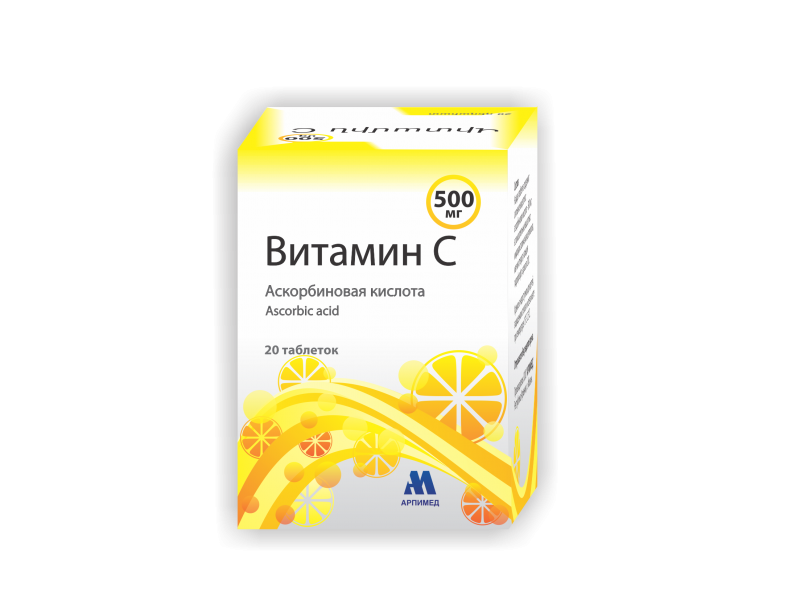 Concurrent administration of antacids and ascorbic acid is not recommended, especially in patients with renal insufficiency. Concurrent use of ascorbic acid with barbiturates or primidone may increase the urinary excretion of ascorbic acid. Concurrent use with cellulose sodium phosphate may result in metabolism of ascorbic acid to oxalate. Concurrent use of desferrioxamine with ascorbic acid enhances tissues iron toxicity especially in the heart. Cases of cardiomyopathy and congestive heart failure have been reported in patients with idiopathic haemochromatosis and thalassaemias receiving desferrioxamine who were subsequently given ascorbic acid. Ascorbic acid should be used with caution in these patients and cardiac function monitored. Concurrent use of disulfiram with ascorbic acid especially with chronic use or in high doses may interfere with the disulfiram-alcohol interaction. Marked acidification of urine resulting from use of large doses of ascorbic acid may accelerate the renal excretion of mexiletine if administered concurrently. Concurrent use of salicylates with ascorbic acid may increase the urinary excretion of ascorbic acid. Ascorbic acid may interfere with biochemical determinations of creatinine, uric acid and glucose in samples of blood and urine. Round biconvex white tablets scored on one side; odorless. 10 tablets in blisters of polyvinyl chloride film and lacquered printed aluminum foil.